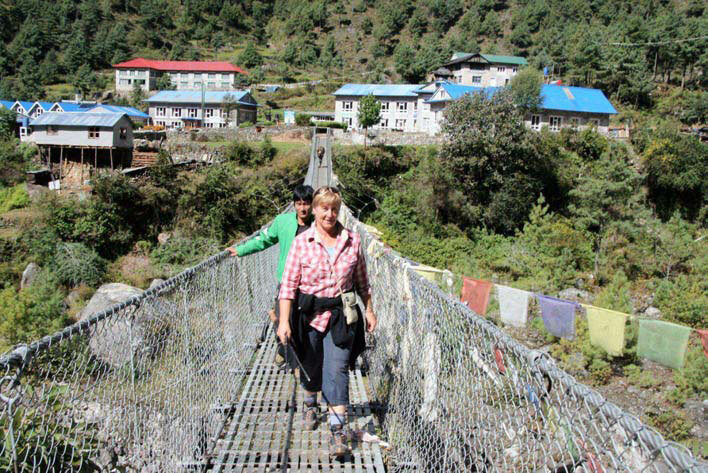 Last Trek Report – Everest, October 2008 - Trekking in Nepal with Teresa, Slow Trekking for peoples of all ages. Lyn (Melb.) was first on the scene in Kathmandu, with Helen, her sometime training buddy arriving next day. A cool gin and tonic on a warm evening at the Weizen was the ideal ice-breaker. Next day Barbera (Sydney), Mark (Ocean Grove) and Des and Christine (Perth) fl ew in an hour or so ahead of Geoff , Janet and Noela who made up the Geelong contingent. We got to Swayambunath just on dusk amidst chattering monkeys and fl ickering butter lamps. Way too dark for the steep stairs so we took the easy road home for an early dinner at the BPD and made a start on the pre-trek briefi ng while we waited (and waited) for the food. Electricity supply is ‘elusive’ at times in Kathmandu. 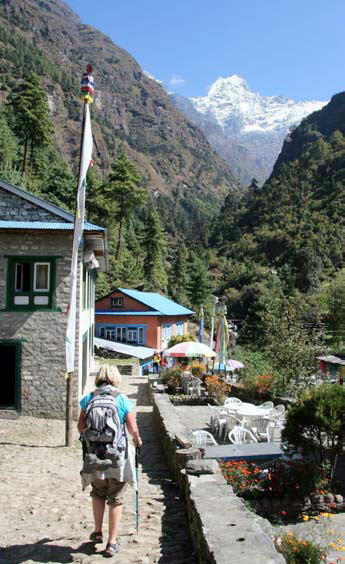 Sunday 12 October saw us walk down to Th amel after breakfast – fascinating if not scenic. Today was the usual frenzy of gear shopping and banking. The ATM was less than generous but other arrangements were quickly sorted. Our last ‘civilised’ meal was consumed at the Weizen with a fl urry of show-andtell (mostly new trekking gear). The flight to Lukla was an interesting one – not my favourite kind. A rather drastic wobble as the co-pilot took over on the way and then a curious diversion at the last minute had me a bit worried – this was only 4 days after the fatal crash at Lukla airport remember. I distinctly recall one ridge which was crossed at such a low altitude I could have reached out of the window and picked the fl owers! Still, somehow we survived and ate a good breakfast at the Kumbu Resort while the porters got the measure of the gear and met their customers. 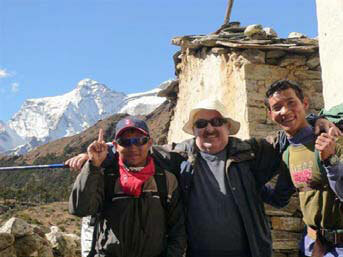 Lahar and Khaji from Pokhara, and Dorje and his brother Danraj fl ew up with us. Bir, Kancha, Subash, Mingmar, Dhan, Akal and Lagpa soon got us organised. Off we go! I think Chris found the first day a bit overwhelming but the rest were fi ne, though I arrived at Phakding with a huge headache (caff eine withdrawal probably). Our lodge was chock-a-block. It rained just as we got in, but only till about 8 pm when a dazzling full moon came over the ridge like a searchlight. Next morning about half the crew opted to visit the gompa across the river while the rest of us basked in the early sunshine and with an extra cup of coffee. Leaving around 11, it took us all day to reach Monjo. Had a long lunch at Benkar. Th at little corner, just past the waterfall, is a great sun-trap. 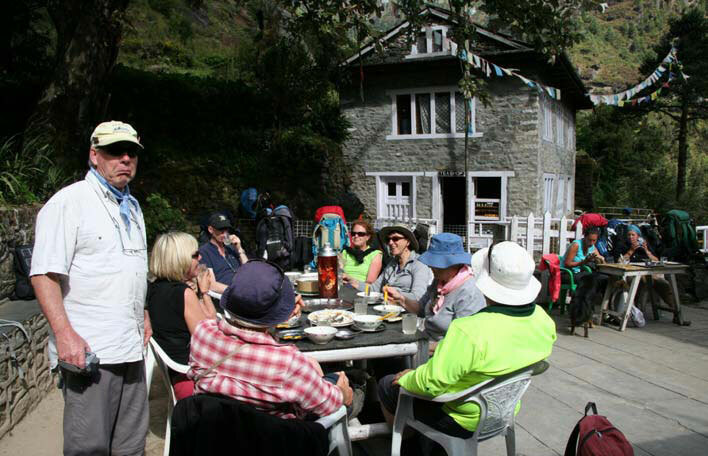 The Nirvana Lodge lived up to its name and the trekkers were, of course, delighted with their rooms, the apple pie and then the singing and dancing that followed. A great night. We head off early the next day after a top brekky and with warm boiled eggs in our pockets – it’s a long way to Namche with no more tea houses. The trail is fl at at first and right beside the river – but not for long. Over the ‘scary’ bridge and then up and up and up and up. Geoff , Janet, Noela and Lyn are soon way ahead of us cooeeing from high above. 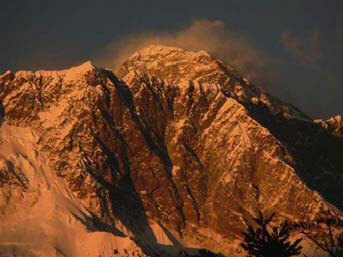 It’s not long before we get our first glimpse of Everest, it’s just the spur everyone needs. after a long spell at the chauthara to refuel, we resumed the slog. It’s easier now but, because the altitude is starting to kick in, it doesn’t feel like it. We really needed a cuppa at the shack just before Namche. Our usual haunt in Namche was full up, actually the whole place was awash in trekkers. I’d never seen it so full. 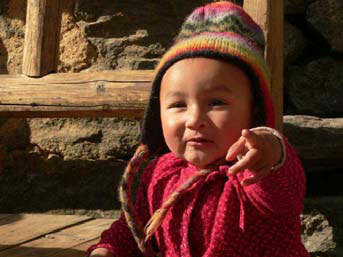 Our runner, Dhan, found us a place at the Sherpa Village Inn. A small, old-fashioned lodge. The rooms and the loos were just ‘OK’ but the staff were really trying their best and so we had a great stay. after a look-see at the big peaks in the morning we took off for a day-walk out to Th amo. It was great this season. The monsoon had been exceptionally heavy. Gentians in profusion and a small, red-foliaged plant I couldn’t identify covered the hillsides. The peaks were clear all day. Lunching at the Maya Lodge we met their daughter who had won the Kala Pattar to Namche marathon (and placed several times). Chris, Helen and Mark took the day off and were basking in the sun reading when we left them – avoiding the ‘wet patch’ outside Des’ window of course!! Des doesn’t want any lunch!! Trekking around to Kangzuma was a nice easy day’s walk wiTheverest, Th amserku, Lhotse, Ama Dablam, Kang Tenga and Kwangde blazing in the midday sun. Th is is truly inspiring scenery. The next day’s trail looked daunting up to Thangboche but we were all in good shape (apart from my knee) so felt optimistic. An early start on a nice fresh morning saw us dropping down through the pines for morning tea at Phunki Tenga. 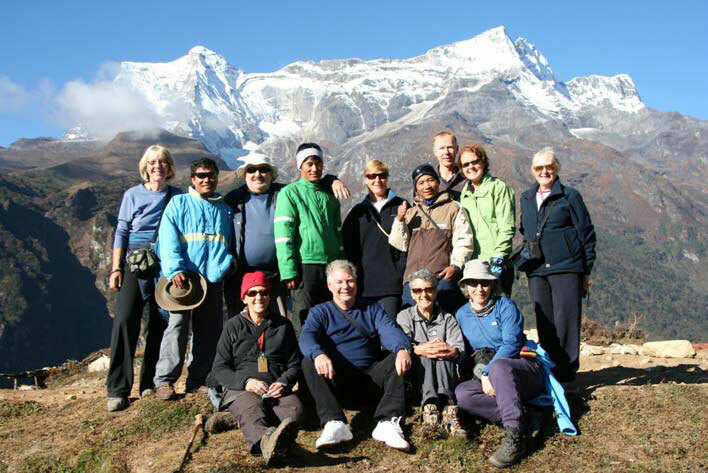 Geoff , Janet, Noela and Lyn were clearly setting a faster pace so they soon set off ahead with the idea that we would reconnect with them at Dingboche. So, up THE REALLY BIG HILL. Some found it easier than others but nobody really struggled this season. We demolished a vast quantity of chips at Th angboche Bakery though. Descending to Devouche we passed the fabulous new lodge built by the Lali Guran’s owners – it will be ready for us for next season. The good thing about the Ama Dablam lodge is the dining room – small room with a big stove. The lodge was packed but somehow everyone got the right food. Lyn, Des and I ducked out at 5.30 to visit the ancient Ani Gompa and got super sunset pics. Next morning was a bit frosty underfoot till we crossed the river for a rest on the rocks – this has become a bit of a ritual. We were uncertain whether Somare or Dingboche would be our halt for the night so we kept our options open till after lunch. Everyone wanted to push on and I think the lead group were pretty surprised to see us stroll into Dingboche around 3.30. Me with an ‘altitude headache’ and Lyn not looking much better. Archie from Georgia put ‘a little colour in my tea’ after dinner (Khukri Rum) so a good night’s sleep was ensured. Anyone who ventured outside to the loo during the night (or went for a stroll to overcome their claustrophobia) would have seen the moonlight on the peaks – sensational. 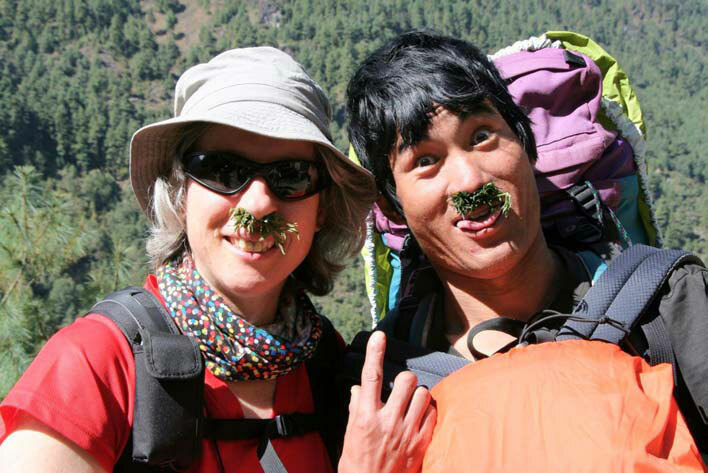 Helen, Mark and Christine opted to stay down at Dingboche today. They climbed up to the stupa for a better view. It is a very lovely spot to spend the day. Totally in awe of nature. The Chukung mob set off with only Des and I planning to return later in the day. Des got really fi red up and climbed a small peak with Danraj before lunch. after lunch we left Janet, Geoff, Noela, Barbera and Lyn with Dorje, Kancha, Khaji, Mingmar and Bir to have a crack at Chukung Ri the next day. It was four days before we saw them all again. They all made it to around 5,700 metres. All agreed it was ‘amazing’, ‘fantastic’, ‘brilliant’ and REALLY, REALLY HARD !!! 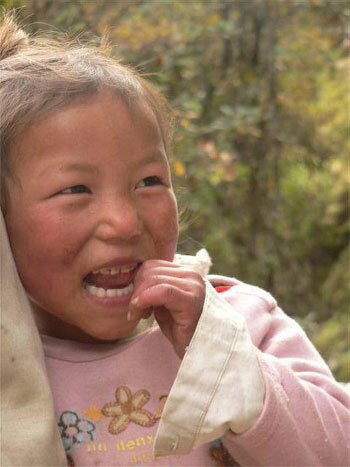 Meanwhile, our band of fi ve did the long trek back down to Phunki Tenga – it’s a really long day. The last one to bed was me – at 7.20! The ‘B team’ had time for a very, very long lunch at Kangzuma (who wouldn’t want to spend time looking at that view again). Kumjung in the afternoon was very civilised. Wide beds, reading lamps, power points, tiled bathrooms and a visit to the local bakery for Danish pastries and cappucini. 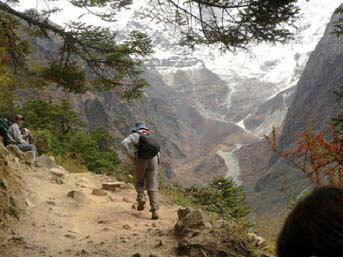 The walk over the ridge to Namche was great. No wind, warm sun and a little boy fl ying his kite from a hilltop while singing his head off . 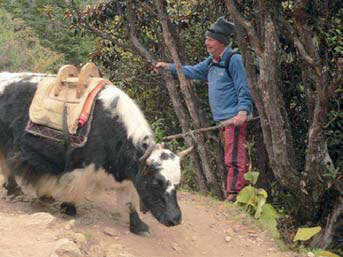 Lyn and Barbera came into Namche the same way and were similarly enamoured of the route. Namche was a frenzy of emails and phones. I shopped a little (hope you like your t-shirt Frank). International calls at 100 rupees ($2) per minute were brief to say the least. Noela had an ‘emotional moment’ in the internet café on the news that her daughter’s baby had come three weeks early. A 7 pound boy called Leo – congratulations!!! The downhill run to Phakding felt really easy with increased oxygen and less altitude. Lunch in the garden at Nirvana was bliss. Next morning Barbera shocked us all into fi ts of laughter by putting on her mascara after breakfast – back to civilisation I guess. On our last day some of us took the ‘porter route’ which is a small trail closer to the river. Didn’t pass anyone at all. Barbera and Lyn shocked some oncomers with the local remedy of chrysanthemum leaves up their noses – it clears your sinuses apparently. 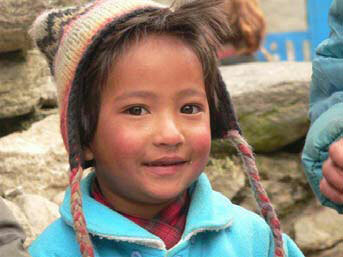 At Lukla we visited Mingmar’s dad Hem for tea and then Bir’s lovely family. It was a bit dark and smoky but the spuds were great (again!). First flight out of Lukla meant up at dawn but the sunrise on the peaks around the airstrip was a delight. The flight was uneventful (unless you count taking off on a 500m runway steeply downhill into the void at all interesting). It was warm in Kathmandu. Vast quantities of hot water were consumed at the BPD (free at last). When I knocked on Mark’s door an hour or so later I nearly said ‘sorry, wrong room’ to the guy that answered. A clean t-shirt and a shave had changed him almost beyond recognition. Banking in town certainly cheered up the cashstrapped trekkers. Everything had increased in price this year, so far from becoming the ‘Bank of Teresa’ as is usual on trek, I ended up fi nishing the payroll back in town for those staff who fl ew down with us. The Aussie dollar is languishing at less than 48 rupees on our return. However, shopping for handicraft s, jewellery, clothes, etc. is still such good value in Nepal that everyone got great souvenirs and gift s for themselves and their families. So, Lyn and Helen are off on a raft ing trip, as are Des and Christine. Noela, Geoff , Janet and Mark are heading back to Oz (Noela can’t wait to see the new grandson). Barbera has opted to do ALL THREE TREKS this season so we are having a well-earned day off before the next gang start arriving. Th anks folks, you were a great group. 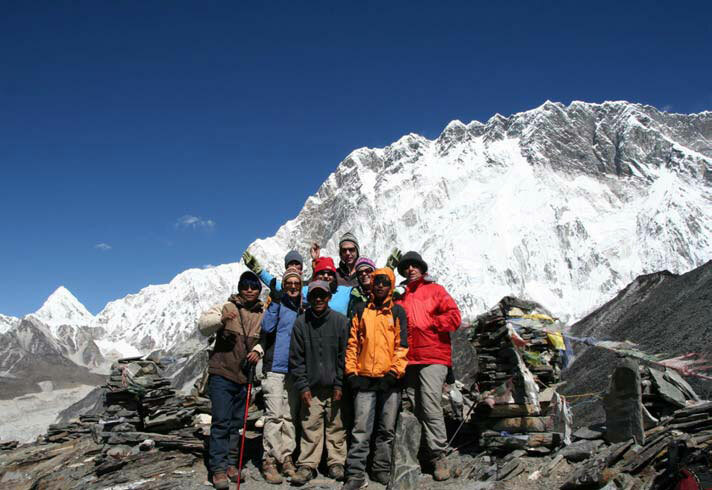 The next Everest Trek is slightly longer (2 days more) and will go all the way to Kala Pattar and Everest Base Camp. It starts in Kathmandu on 4 April. Not quite full. Phone 03 9315 9617 or email teresadidi@slowtrekking.com or vonschwichtenberg@gmail.com, teresadidi@slowtrekking.com for more info. Website at www.slowtrekking.com. Lyn McKelvie (some of the photos).